Decorate an old paint can and add your Christmas tree trimmings! I printed "Celebrate the birth of Jesus" on frosted white paper and wrapped it around a small paint can. 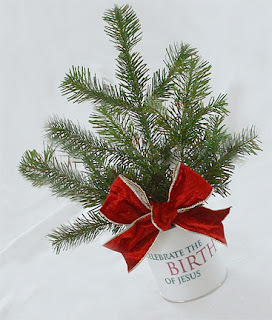 Add water and some extra evergreen boughs. Accent with a large velvet wired ribbon for the finishing touch! Lovely! I'm hosting a neighborhood women's Christmas coffee gathering this weekend and this little centerpiece would be perfect at the table. I don't have evergreens, but maybe the neighbors won't mind me snitching some! Love this. I am also thinking of a spin off of this for our New years Eve bash. If I do, I'll post and let you know!